Citation Information: J Clin Invest. 2012;122(8):2916-2927. https://doi.org/10.1172/JCI60387. Exaggerated contraction of airway smooth muscle is the major cause of symptoms in asthma, but the mechanisms that prevent exaggerated contraction are incompletely understood. Here, we showed that integrin α9β1 on airway smooth muscle localizes the polyamine catabolizing enzyme spermidine/spermine N1-acetyltransferase (SSAT) in close proximity to the lipid kinase PIP5K1γ. As PIP5K1γ is the major source of PIP2 in airway smooth muscle and its activity is regulated by higher-order polyamines, this interaction inhibited IP3-dependent airway smooth muscle contraction. Mice lacking integrin α9β1 in smooth muscle had increased airway responsiveness in vivo, and loss or inhibition of integrin α9β1 increased in vitro airway narrowing and airway smooth muscle contraction in murine and human airways. Contraction was enhanced in control airways by the higher-order polyamine spermine or by cell-permeable PIP2, but these interventions had no effect on airways lacking integrin α9β1 or treated with integrin α9β1–blocking antibodies. Enhancement of SSAT activity or knockdown of PIP5K1γ inhibited airway contraction, but only in the presence of functional integrin α9β1. 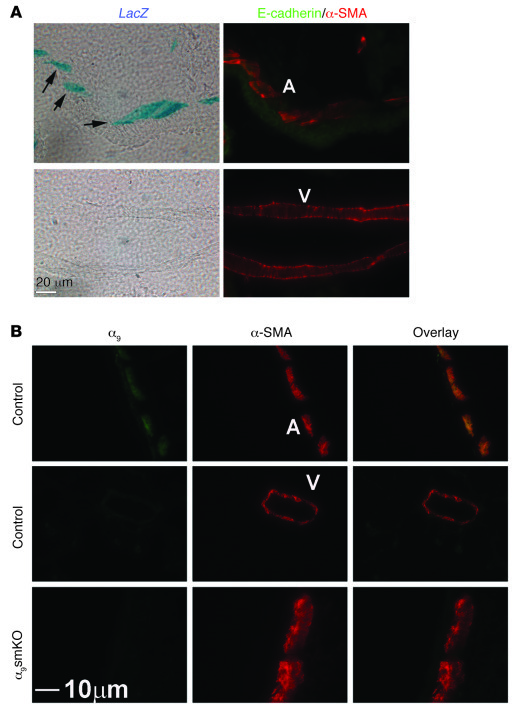 Therefore, integrin α9β1 appears to serve as a brake on airway smooth muscle contraction by recruiting SSAT, which facilitates local catabolism of polyamines and thereby inhibits PIP5K1γ. Targeting key components of this pathway could thus lead to new treatment strategies for asthma. Integrin α9β1 is specifically expressed in airway smooth muscle cells in the mouse lung. (A) X-gal staining on 10-μm mouse lung sections from Itga9LacZ-knockin reporter mice. β-gal–positive staining is indicated by arrows. The same section was also used for immunofluorescent staining with anti–E-cadherin (green) and anti–α-SMA (red) to identify airway and vascular smooth muscle (A and V, respectively). (B) Immunofluorescence staining of mouse airway and vascular smooth muscle with antibodies against integrin α9. α9smKO mice had decreased expression in airway smooth muscle. Scale bars: 20 μm (A); 10 μm (B).